Being BAMFs in Banff — breathing happy. July 25, 2015 in Reddy to take the U.S.
We woke up SUPER early (like in the 4 o’clock hour) to make it back to across Vancouver Island to the ferry dock in time for the 8:30 departure. We slept in the car for the entire duration of the 2-hour ferry, broken up by screaming children playing tag in the vehicle cargo level of the ship. Luckily I’m a fairly hard sleeper but Katie dreamt of suddenly opening the car door to close line the little bastards as they ran by. Once we hit the mainland we drove another 4 hours to Kelowna in the Okinawa Valley where we had originally planned to stay a night with a couch surfer. However, since I had slept in the car while Katie drove the entire day I woke up really well rested and prepared to drive an additional 5 hours all the way to Banff, Alberta. So we decided not to waste a night in the Valley (where there wasn’t much for us to see/do aside from wine – which we’ve had enough of lately) and drive on through. We made it to Banff after a GEORGOUS drive through the mountains, just before sunset. Since this was by far our longest travel day yet (nearly 14 hours!!) we determined that if we were ever going to cheat and get a hostel, that tonight was the night. So we bit the bullet and paid $46 each to have our own beds and a hot shower. So after some late night discussions with a couple reputable businessmen/producers I’ve decided to switch up my scribing style a little bit. I need not apologize for the inconsistency. Change is growth. We are so many weeks behind that the day count followed by the date has become really hard to keep track of. So instead of doing a strict day-by-day recap, I’ll just focus on highlights and more of an overview in addition to adding a format for rating each city we visit. Also going to bring back the “Things we learned” list (back by popular demand) based on our readers feedback – please keep those comments coming, we love your input! The morning after our night stay at the hostel we were in the hostel kitchen helping ourselves to breakfast when a man named Jamie with an English accent approached us to confirm that he had been in the proper room last night. Apparently he wasn’t used to co-ed dorms and had thought he had wondered drunk into the woman’s bunks last night when he saw Katie and I (the only women in there). We assured him it was okay and after just a few brief moments realized he was hilarious and that we must spend the day with him. I borrowed some bear spray from the hostel and we set off for Sulphur Mountain, which was an excruciating hike with more than a dozen cut backs and was basically straight up. Most sane people choose to take the gondola up. But not us. 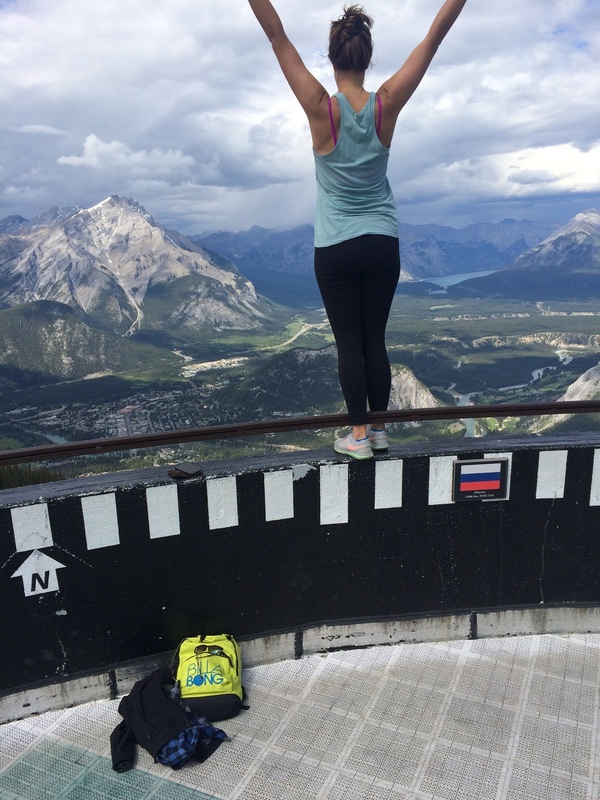 The view from the top offered 360-degree lookouts over all of Banff. As always, totally worth it. Somewhere between breakfast and the top of Sulpher Mountain, Jamie had realized I was on Below Deck. He decided we should really take advantage of my washed up D-list celebrity status and ask for some freebees. So he spoke with the manager at the restaurant on the top of the Sulpher Mountain observatory and to my surprise was able to sweet talk his way into getting all three of us a free meal of our choice, including a drink and free gondola rides down!? All together may have been close to a $200 value. We played with some chipmunks and narrowly escaped a vicious rain storm before heading back down the mountain. That evening Jamie introduced us to the Fairmont Hotel, which is a castle nestled in the side of the mountain. He thought perhaps he could get us all a room there for the night using the same strategy he did to get us free lunch and gondola rides, haha. Fail. We did however meet the musical act that was contracted to play in the bar/lounge at the hotel all week. His name was Luke and he offered Katie and I his room key while he was downstairs playing music all night so that we could go take hot showers since we had told him we would likely be camping that night. After we cleaned up we met back up with Luke. We had a couple cocktails but the bar stopped serving shortly there after. On our way back upstairs Katie passed a woman wondering through the hotel that invited her to a party in Room 614. We ran up to Luke’s room so he could grab his guitar, because if you’re going to party crash, you might as well bring the talent. We took the elevator down to the sixth floor. Now, despite that the Fairmont IS a castle and the hallways ARE fairly confusing and have some resemblance to that of the Overlook Hotel from The Shining, the signs DO clearly indicate the direction of rooms in the standard format (600-620 à). So we follow the signs and are counting up the numbers as we pass by the rooms. 611… 612… 613…… 615… wait a minute, we passed it? Turn around and count down 617… 616… 615…… 613. THERE IS NO 614!!!!!! Katie, are you SURE she said 614? Was that woman playing a prank on us? Why is there no 614? Even if she didn’t say 614, what are the chances that Katie heard 614 and then there happens to be no room number 614? Are we just too drunk to locate the real room number 614? Is that woman going around telling people to go to 614 on purpose? Is there even a party going on? So many questions. Luke breaks into song. We’re all beyond confused and defeated we head back towards the elevator in an effort to not have our organs harvested in the bathtub of the ghost room 614, when Katie hears a ruckus coming from the end of an alternate corridor. We follow the noise and ALAST we find the party. It was in room 647. Still no idea how Katie heard 614, nor why 614 does not exist. The party was fun but moments after we got there the hotel security came and kicked everyone out. The hosts were pissed and so we rebelled and took the party to the halls and elevator of the hotel. Luke continued to play music and everyone was having a grand ol’ time until maybe 20 minutes later someone pulled the fire alarm. At that point it was probably 4 or 5 A.M. All the fire doors shut in the massive cavernous hotel and we found ourselves trapped like rats between the ball room and the lobby. It had been a REALLY weird night and so by the time the alarm went off and the elevators started working again, we decided to throw in the party towel and call it quits. Katie and I slept on the floor of Luke's room. Luke treated us to AYCE brunch and Caesar’s (the Canadian version of a bloody mary) in the morning. We got on the road shortly there after and headed south. Thank you Canada for a wonderful visit! 1. Ferries fill prior to departure, so get there WAY early if your day depends on making that ferry time. 2. Always check the weather because normally thunderstorms and camping do not mix. 3. Load your cellular directions prior to leaving a Wi-Fi zone.